Tsada Golf and the Monastery of Stavros Mythis 2 km, 10 minutes from the monastery of Ayios Neophytos and 25 minutes from the monastery of Panagia Chrysorrogiatissa, two traditional taverns where you can taste the delicious mezedes, churches and chapels around the village with archaeological value, wineries in the surrounding villages. Kallepeia has numerous signposted paths or nature trails, some more challenging than others, but all are a feast for the senses, especially in the springtime when you can experience the sights, sounds and smells of nature at first hand. Latsi – Baths of Afrodite 30km. 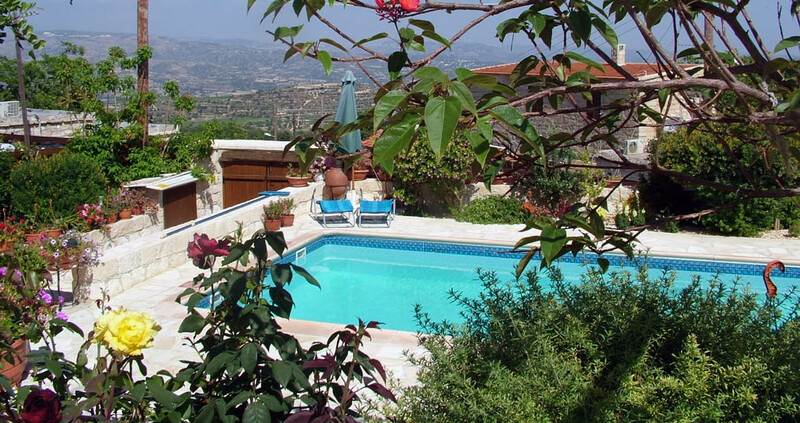 To the northeast of Pafos, some 13 km away, is Kallepeia, built at 500m above sea level. The village of Kallepeia is so well known for its beauty, that its name actually derives from the Greek word of the same meaning. Today Kallepeia preserves many of its old, authentic features such as the stone built houses with the large courtyards, the great number of pitchers, clay pots and earthenware jars, the stone built wine-press, the abundance of marble rocks (of the area) most impressively seen on the Monastery of the Holy Cross (Stavros tis Minthis) which is built entirely out of marble. Of great importance is also the old church of Ayios Georgios. The surrounding area is overgrown with rich vegetation, plantations and vineyards and lends itself to beautiful walks. Nature seems to have dresses Kallepia with tis most beautiful colours. Mountains, cliffs, rich valleys with wild greenery as well as agriculture areas, compose a unique location of beauty. The village is crossed through the river Ezousa with its smaller rivers Ammati and Kalamos. This river used to be the source of life for the farmers. On its banks there are pine trees, cypresses and big terebinths. There are many natural springs which flow during the whole year round. These are: the spring of Rino , Amatiou and Kalamou. The springs are connected at some point and create the river of Kallepia. All three of them are used during the summer months for the irrigation of fruit and vegetables. In the village vineyards are mainly cultivated. Kallepia is one of the first vineyard villages in Paphos. There are also apple trees, lemon trees, almond trees, carob trees, wheat, vegetables and olive trees which are grown in the village area. It is also worth mentioning that the Community Board of Kallepia has created green areas , specifically three parks , one camping are , bush and forest areas.